Digital Signage Blog by Mirada Media – Page 16 – Digital Signage News for Mirada Media, Inc. Opened since 2000, Le Centre Médical Lacordaire is a public clinic located in St-Leonard at 5650 Jean-Talon, corner Lacordaire, Suite 201. Le CML offers several medical and paramedical services including cardiology, gynaecology, urology, endocrinology, andrology, pneumology, paediatrics, as well as nutrition consulting and many other services. Le CML was looking for a novel way to inform patients and keep them entertained while sitting in their multiple waiting rooms. As medical professionals, the clinic employees have the responsibility to disseminate health advisories and to promote information on important health issues. An added bonus for them would be if the clinic’s partners could publicize their health-related products and services. The information needed to be displayed in an eye-catching and would consist primarily of their services, health notices, general information and entertainment. Mirada Media Inc. addressed Le CML’s needs with an integrated digital signage solution composed of our Channelview system, a commercial grade media appliance preloaded and configured with their CV Player software along with two 40″ commercial LCD monitors by Samsung, displaying captivating and dynamic HD content. This system allows full control of the content as well as the screens, from our office in Anjou. It also allows the flexibility to add new players easily, another of CML’s prerequisites since the clinic would soon be expanding and opening a new private health service in the same medical complex. 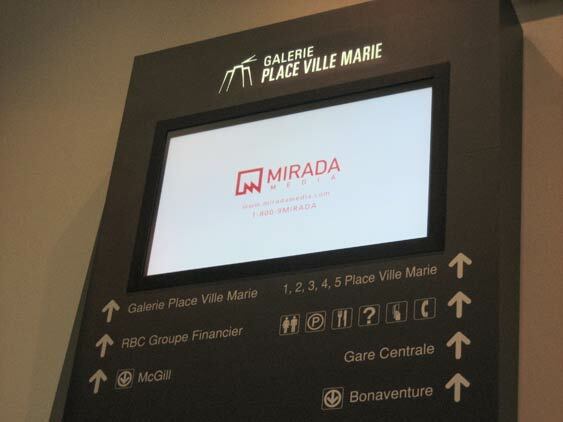 Mirada Media Inc. was mandated to provide turnkey management of CML’s new digital signage network. Elements such as content scheduling, network programming and management, as well as hardware monitoring and support are all performed via the ChannelView system from our office. This setup allows Le CML to change the dynamic content on their screens as often as they like without the added expense of sending someone on site to change a static sign. The ChannelView system offers a digital platform for dynamic content distribution (video, Flash, etc.) and live information sources (news, weather, etc. from RSS feeds) which are updated instantaneously. This unparalleled flexibility is a key factor in the increasing adoption of dynamic digital signage in every marketplace – from retail to corporate to educational environments, and more. 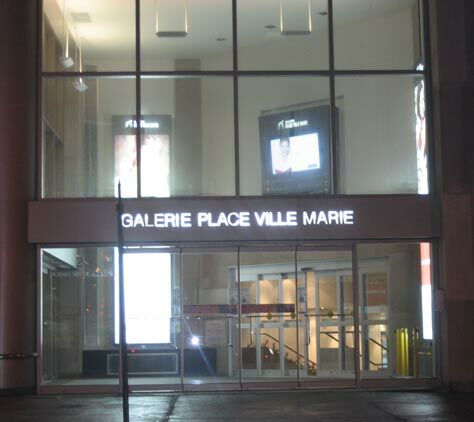 Galerie Place Ville Marie, a shopping center located in downtown Montreal, welcomes an average of nearly 1 million people every month. A captive clientele combined with lucrative sales per square foot, explains why Place Ville Marie is sought after by many merchants eager for a wealth of business opportunities. The Shopping Promenade is like no other, housing an array of nearly 80 upscale shops and boutiques, as well as a food court that groups 20 of the better known fast food restaurants. SITQ, the Place Ville Marie complexe operator, is a leader in the North American and Western European real estate industries. Founded by the Caisse de dépôt et placement du Québec with invested capital of $9 million, SITQ today holds a $10.3-billion, property portfolio, comprised mainly of prestigious office buildings and business parks located in major cities in Canada, the United States, France, the United Kingdom and Germany. Together, these properties represent over 35 million square feet (3.3 million square meters) of space. 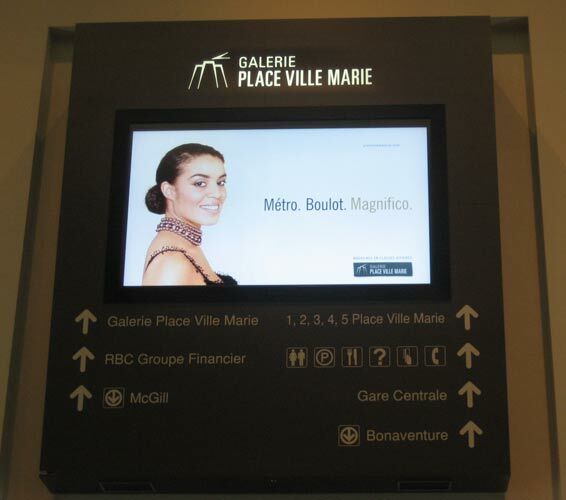 SITQ was searching for a novel and flexible way to inform shoppers and the general public entering Place Ville Marie via the new entrance on Cathcart and University streets. The information being displayed would have to be presented in an eye-catching way to its business-class clientele and would consist primarily of upcoming events, new promotions, new services and contests that could change on a daily basis. In the future, SITQ also wanted the ability to offer advertising space to tenants as a value added service. Mirada Media Inc. responded to SITQ’s needs with an integrated digital signage solution composed of its ChannelView software and system along with a NEC 57 inch LCD display panel, displaying captivating and dynamic High-definition content. 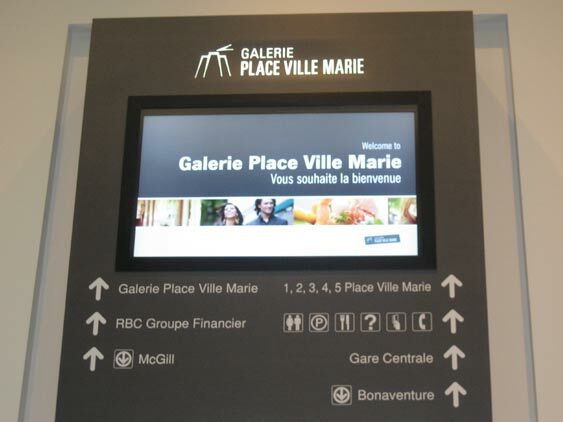 These components made Place Ville Marie the first establishment in Quebec to use such a large LCD panel for digital information distribution. Mirada Media Inc. was mandated to provide turnkey management of SITQ’s new digital signage network. Elements such as content scheduling, network programming and management, as well as hardware monitoring and support are all performed via the ChannelView system from Mirada Media’s office in Anjou. This setup allows SITQ to change the dynamic content on the screen as often as they like without the added expense of sending someone on site to change a static sign. The ChannelView system offers a digital platform for dynamic content distribution (video, Flash, etc.) and live information sources (news, weather, etc. from RSS feeds) which are updated instantaneously. This unparalleled flexibility is a key factor in the increasing adoption of dynamic digital signage in every marketplace – from retail to corporate to educational environments, and more.